With the BOE gearing up to announce its policy decision, pound pairs could see a pickup in volatility before heading further south. 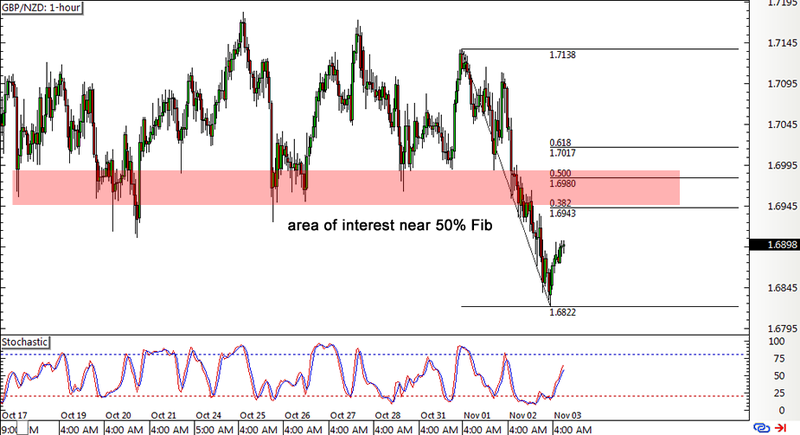 What do you think of this short-term correction on GBP/NZD? Thanks to stronger than expected data from New Zealand, GBP/NZD was able to breach the 1.7000 major psychological support then hit a low of 1.6822. Price seems to be pulling up from this sharp dive earlier in the week so I threw in the Fib retracement levels to spot a potential entry zone. The 50% Fib is close to the 1.7000 handle and the area of interest where pound bears might be waiting with their sell orders. Stochastic is still on the move up anyway, which means that the pair is still in correction mode for now. The upcoming BOE statement could take GBP/NZD back up to this area of interest, especially if Governor Carney attempts to reassure market watchers that the U.K. economy can stay resilient and decides to focus on the positive impact of the weaker pound on inflation. The U.K. manufacturing survey, however, seems to be painting a less rosy picture as the PMI fell from 55.5 to 54.3 to reflect slower industry growth. The services PMI is due today and a fall from 52.6 to 52.5 is eyed. Meanwhile, the Kiwi could regain ground if the economy continues to show green shoots. Earlier this week, the New Zealand GDT auction printed an impressive 11.4% gain in dairy prices while the quarterly jobs report indicated a 1.4% pickup in hiring. The RBNZ is set to announce their policy decision next week and even if they do cut rates, Governor Wheeler would probably reiterate that they won’t be easing again anytime soon. Short GBP/NZD at 1.6975, stop loss at 1.7125, profit target at 1.6825 for a simple 1:1 play. I’ll risk 0.5% of my account on this setup.